The city council in Joseph Stalin’s Georgian hometown of Gori struck down on October 2 a motion to restore the Soviet dictator’s monument in the town square. The fierce debate left unclear the fate of the grand, six-meter statue that just refuses to be consigned to the ash heap of history. After the bronze Stalin was kicked off its pedestal in Gori in 2010, it seemed to acquire a life of its own. 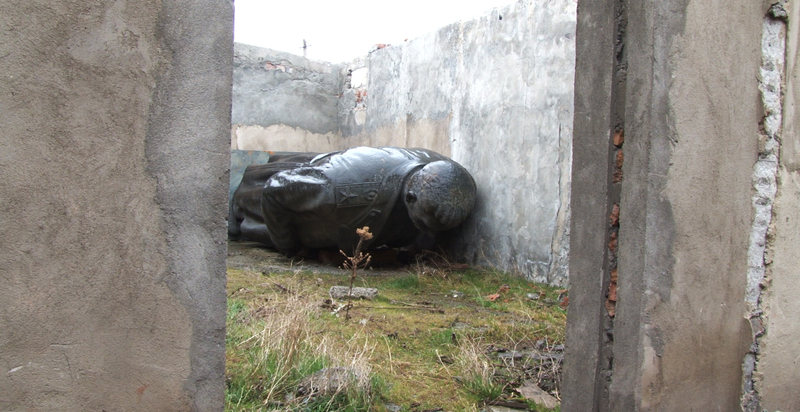 Gori’s diehard communists and Stalin fans, who view the dictator as their small-town-boy-made-good, carried the deposed monument around until they plunked him down in an abandoned construction site, some 15 minutes outside of town. There, lying face down and exposed to the elements, the Great Leader has been entrusted to the care of an elderly gate-keeper and his dog. Gori’s Stalinists have made stubborn attempts to bring their icon’s statue back to the town center, but central government officials have resisted these efforts, which they view as an embarrassment to the country’s goals of Western integration. Today’s debate on the topic at Gori’s city council erupted into a shouting match between Stalin supporters and opponents. The Stalinists argue that Joseph Visarionovich is Gori’s (and Georgia’s) most famous son and the major tourist attraction in gritty Gori, a town some 40 kilometers west of the Georgian capital, Tbilisi. Visitors indeed flock to the Stalin Museum which features a massive collection of Stalin memorabilia, including his death mask and a tiny shack where the comrade-in-chief, then known as Soso, the Georgian diminutive for his first name, spent his early years. But, as elsewhere in the former Soviet Union, Soso’s transformation into Stalin does nothing to impress many Georgians. Those who oppose restoring his massive monument point to the heavy toll that Georgia took during the Great Terror and call for respect for survivors. The monument could be placed on the museum’s premises, Netgazeti.ge reported, but that’s an idea that has been around for years and not acted upon. It requires the permission of Georgia's culture ministry, and, so far, no sign that anyone wants to run with the idea.